Kolyadki with fillings, with potatoes, or carrot, or millet. Kolyadki with fillings: with potatoes, or carrot, or millet. Kolyadki is very small pies with a different fillings. 7 - 8 potatoes, peeled, cooked, mashed. 2 - 3 tbsp butter. 300 g (10,6 oz) carrots, scraped, grated. salt, lemon juice to taste. 1 cup millet (may be used buckwheat). Combine all ingredients for dough. Knead the dough by hand or machine. If by hand, turn it out on a floured board and work it until it is smooth and elastic, approximately 10 minutes. If using a dough hook on an electric mixer, knead the dough at the slowest speed for about 5 minutes. Add more flour if need. Shape the dough into a ball and put it in the oiled bowl. Cover the dough with a kitchen towel and leave to stand for 20 - 40 minutes. Roll out the dough on a floured board, make a small circles and put a small ball of filling onto each. The edges have to be joined and pinched together. 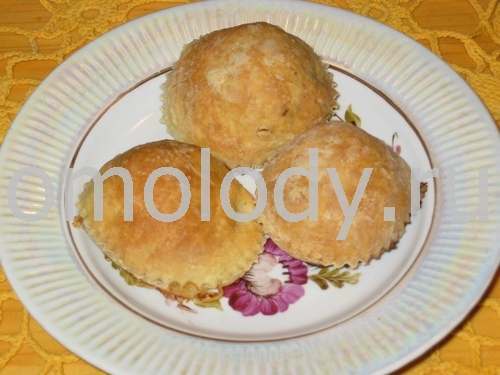 Distribute Kolyadky on greased baking sheet and bake in temperature 220 C / 428 F oven until golden brown. To make potato filling, Combine all ingredients, mix very well. To make a carrot filling: put all ingredients into skillet and fry stirring, stew. To make a millet filling: put all ingredients into pot and cook, until millet tender.